An unlikely team offers a controversial hypothesis about what enabled animal life to get more complex and diverse during the Cambrian explosion. The wild profusion of animal forms that erupted half a billion years ago during the Cambrian explosion may have been enabled by genetic developments that allowed cells to protect themselves better against the effects of oxygen. When Emma Hammarlund of Lund University in Sweden first reached out to her colleague Sven Påhlman for help with her research, he was skeptical he’d have much insight to offer. He was a tumor biologist, after all, and she was a geobiologist, someone who studied the interplay between living organisms and their environment. Påhlman didn’t see how his work could possibly inform her search for answers about the rapid proliferation and diversification of animal life that, half a billion years ago, forever changed Earth’s evolutionary landscape. In spite of Påhlman’s initial reservations, however, the pair has collaborated over the past four years to put forth a new interdisciplinary hypothesis, published in Nature Ecology & Evolution earlier this year, explaining why it took so long for animals to burst onto the scene. For most of its 4.5-billion-year history, Earth has sustained life — but that life was largely limited to microbial organisms: bacteria, plankton, algae. Not until about 540 million years ago did larger, more complex species begin to dominate the oceans, but within just a few tens of millions of years (a blip on the evolutionary timescale), the planet had filled up with all kinds of animals. The fossil record from that period shows the beginnings of almost all modern animal lineages: animals with shells and animals with spines, animals that swam and animals that burrowed, animals that could hunt and animals that could defend themselves from predators. Like many biologists, Hammarlund wondered why it took so long for complex animals to emerge — and why, when they finally did, it happened so suddenly. One of the leading theories about this hotly debated question holds that a skyrocketing rise in atmospheric oxygen around that time triggered what’s known as the Cambrian explosion. Earlier, when oxygen was scarce, the simple animals in the seas had anaerobic metabolisms that did not depend on it, and they even found oxygen problematic if not toxic. By shifting to aerobic respiration, however, animals gained an enormous metabolic advantage because the amount of energy that cells could produce per respiration cycle increased nearly twentyfold. That extra energy may have been what powered the greater complexity witnessed during the Cambrian period: increased biomass, improvements in their cellular systems, more complex body structures, and the capacity for energy-intensive movement and predation. “I think the story of the animal kingdom is one of learning to take advantage of a remarkable energy source — oxygen — while also learning to avoid the potential hazards that are associated with it,” said Charles Diamond, a graduate student at the University of California, Riverside, who works with the geologist Timothy Lyons, a strong proponent of the oxygen-centered argument. It is by no means certain that a big uptick in atmospheric oxygen caused the Cambrian explosion: Many scientists give more weight to alternative theories about the emergence of new genetic capabilities or major shifts in ecological interactions that prompted new forms to evolve. Nevertheless, animals in that period would have needed to develop physiological innovations to deal with the abundance of oxygen. The fossil record shows an explosion of complex and diverse animal life dating back to approximately 540 million years ago. One of the most abundant and iconic creatures of the era was the trilobite, an armored animal that flourished for tens of millions of years. 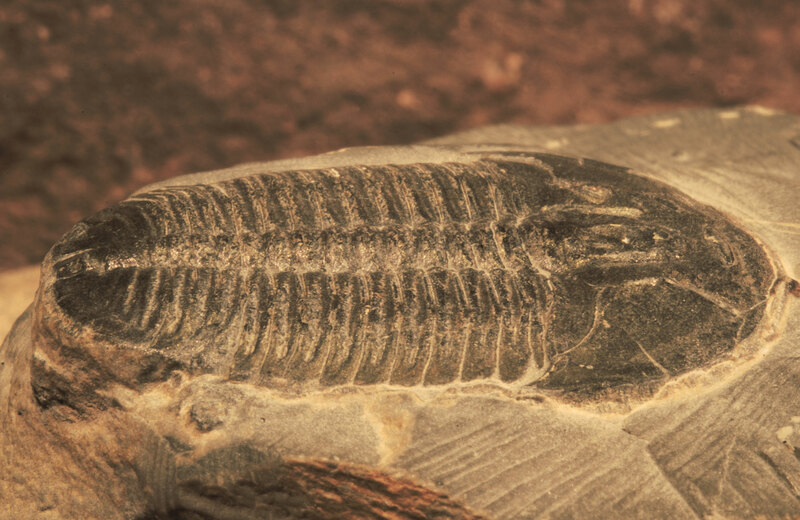 Pictured here, a fossil of the trilobite Elrathia kingii. Hammarlund had a hunch about how they did it, and how those changes might have incidentally unlocked animals’ morphological freedom. To prove it, she needed Påhlman’s help. In particular, she needed his knowledge of stem cells and cancer. Their hypothesis is that the evolution of the capacity to maintain undifferentiated cells — even when those cells were exposed to higher levels of oxygen — allowed animals to keep stocks of stem cells for tissue growth and repair. That capacity, in turn, made it possible for animals to become more complex and diversify. Stem cells have a “pluripotent” ability to give rise to the other cell types that make up healthy tissues. Throughout life, they play a crucial part in the regeneration and repair of tissues. Scientists are still trying to find out what enables stem cells to maintain their pluripotent, undifferentiated state when other cells cannot. One factor researchers have identified is oxygen: The cells require low oxygen levels to remain in their stem states. Experiments have illustrated that exposing stem cells to greater amounts of oxygen usually causes them to differentiate abruptly. This observation explains why stem cells are so often sequestered in regions of the body like the bone marrow, where oxygen levels are relatively low (hypoxic). But there are exceptions to this rule: Stem cells also reside in more oxygen-rich niches, such as the retina and the skin. Cancers have stem cells, too, which help drive a tumor’s formation and growth, and those cells are resilient in the face of oxygen. Påhlman and Hammarlund figured that if they could determine how our bodies and malignancies preserve those stem cells despite the oxygen, they might be able to explain how early animals solved their own oxygen problems millions of years ago. So they focused on a family of proteins called hypoxia-inducible factors (HIFs), chief among them the protein HIF-2α. Its activity is heavily implicated in cancers of the kidneys and the sympathetic nervous system (including the neuroblastomas that Påhlman studies). The HIFs help modulate how cells react to different oxygen conditions. When oxygen is low, cells activate HIFs to shift their metabolisms from aerobic to anaerobic and to start other processes that keep the cells alive; when oxygen is high, the HIFs are no longer needed and get degraded. But HIF-2α remains active in some tumors even during oxygenation, according to Påhlman, and it helps the cells act as if they’re experiencing hypoxic conditions when they aren’t. Take neuroblastoma cells, he said: Suppressing HIF-2α in the stemlike cells causes them to differentiate, suggesting that the protein is part of what keeps cancer stem cells in an immature state in the presence of oxygen. Hammarlund and Påhlman then took a leap: They posited that HIF-2α functions similarly in normal animal tissues. They’ve seen some preliminary evidence of this in the skin and the sympathetic nervous system (knocking out the protein in the latter interferes with its development), but further experiments are needed to confirm the idea. Next Hammarlund set out to unpack how HIFs might have factored into the evolutionary story of the Cambrian explosion. Picture a blob of ancient animal cells in which HIFs hadn’t yet evolved. The distribution of oxygen within the blob would have dictated that stem cells could hide only at the blob’s center, safely away from oxygen, while differentiated cells filled the more oxygenated periphery. All would be well, so long as the oxygen in the organism’s environment remained stable. But any shift in the oxygen level around the multicellular blob would change the oxygen gradient within it as well. Hammarlund then considered HIF-1α, the molecule in vertebrates that she and Påhlman describe as resembling “the ancestral HIF form” that would have evolved first. It behaves as a metabolic switch that allows cells to “enter or exit a low-oxygen consumption mode,” she said, so it would have allowed emerging animals to be less sensitive to oxygen fluctuations in their environments. “Organisms could start to manage stem cells better,” Hammarlund explained. Their tissues could grow with fewer oxygen-imposed constraints, so they could be made of more diverse cells growing in more varied structures. Moreover, the animals could begin to populate more habitats with varying oxygen levels. Hammarlund wonders whether the Ediacaran creatures, which disappeared at the start of the Cambrian, lacked this ability and therefore lived in the deep parts of the ocean because oxygen concentrations were more stable there. Before the Cambrian explosion, during what’s known as the Ediacaran period, the ocean was populated by large, soft-bodied organisms. They all went extinct at the start of the Cambrian. 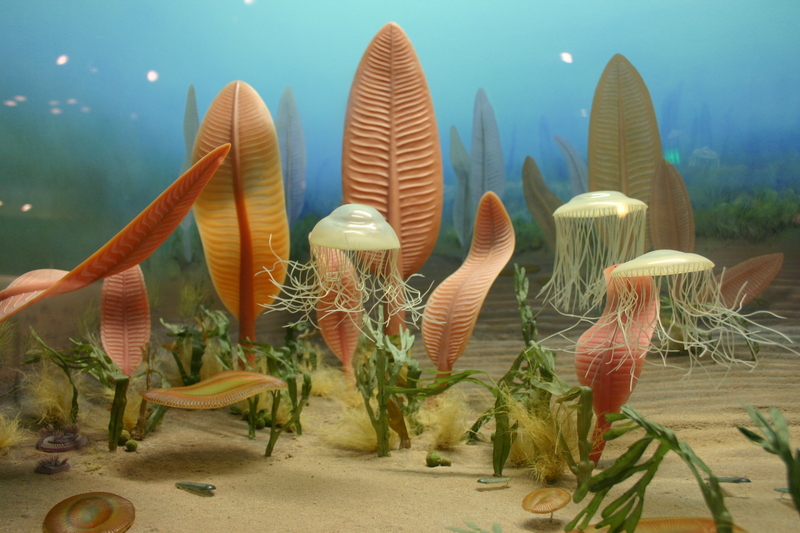 The diorama of Ediacaran life shown here is from the Smithsonian National Museum of Natural History’s Hall of Fossils. When HIF-2α entered the picture, it would have given vertebrates even greater flexibility because their tissues could behave as though they were hypoxic regardless of their environment. This would have enabled them to form complex organs from diverse, highly specialized cells without regard for disruptive oxygen exposure. “HIF-2α was an even better tool for sustaining . . . pockets of hypoxic responses,” Hammarlund said. Stem cells could have resided in regions that were completely isolated from the oxygen gradients throughout the rest of a tissue. In contrast, she said, many invertebrates such as insects spend most of their lives as larvae living in low-oxygen conditions, and they can’t regenerate tissues as vertebrates can. 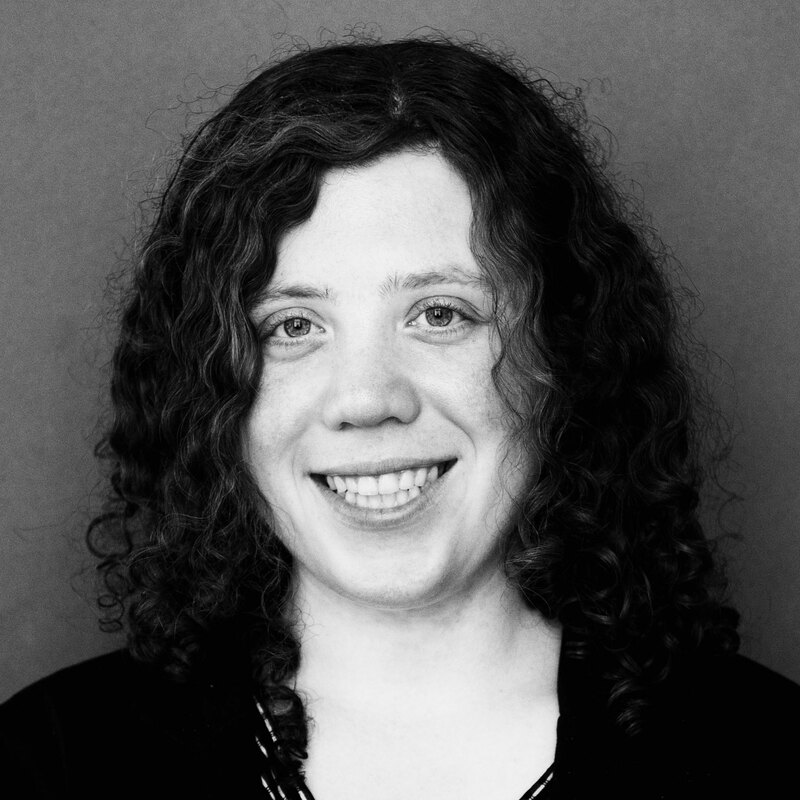 Hammarlund thinks that invertebrates may not be as good as vertebrates at maintaining viable stem cells in their adult tissues for regeneration. In short, the development of the HIF proteins presented the “proper key to get at the gold mine,” Hammarlund said. It wasn’t until HIF and HIF-2α came along that animals could start to use oxygen for more metabolic energy, build more elaborate tissues and cope better with oxygen damage. “The HIFs probably weren’t the only key, but they’re one we now know,” she said. She and Påhlman hope to uncover other mechanisms as well, but first they need to test essential components of their HIF hypothesis, primarily the idea that the hypoxia reaction is specifically invoked in normal tissues to maintain stem cells. Tammie Bishop, a cancer researcher specializing in hypoxia at the University of Oxford, has doubts. Scientists have yet to see HIF-2α highly expressed in oxygen-rich (oxic) tissues outside of the laboratory, she said. Moreover, when the protein was genetically knocked out in mice, they experienced health problems but not to the degree she would expect if the quality of their stem cells were compromised. Randall Johnson, a biologist at the Karolinska Institute in Sweden, agreed that there are problems with Hammarlund’s assumption that HIF-2α’s activity in tumors would correspond to what’s happening in normal tissues. “But I think it’s perfectly reasonable for them to make these jumps, in the spirit of trying to make important, novel connections,” he said. Påhlman and Hammarlund believe that the link between HIF-2α and tumor formation is rooted in the protein’s evolutionary role in maintaining the states of stem cells. “Maybe cancer is the price vertebrates, which develop cancer more often than invertebrates, pay for the ability to live well in an oxic environment,” Hammarlund said. Påhlman agreed. “I always claim tumors don’t invent anything,” he said. “They just hijack normal biological pathways and functions [and] hook onto anything that will promote growth and survival.” Clinical trials are currently testing whether inhibiting HIF-2α might be effective in treating certain cancers. Cancer isn’t the only modern demonstration of HIF-2α’s original purpose. People who live at extremely high altitudes on the Tibetan plateau, for example, possess a mutation in a gene that encodes HIF-2α, causing the protein to function less effectively. That mutation also protects Tibetans from the otherwise detrimental health effects of living at lower oxygen levels, including altitude sickness, increased risk of stroke and pregnancy complications. “I wonder if the HIF-2α phenotype is less necessary at high altitudes” where oxygen levels are always depleted, Hammarlund said. Corrections: This article was updated on March 12. The original text stated that researchers other than Hammarlund are looking into the stemness of the Ediacaran fauna; that is not the case. A sentence was also changed to clarify that although HIFs evolved in animals, it did not appear with the first animals. A sentence was also corrected to note that the mutation in the high-altitude Tibetan population is specific to the gene for HIF-2α, not for HIFs in general.